A while ago I decided to make my own veil. I bought all the fixin's, looked at inspiration photos, picked a design, found a tutorial. ThenI did nothing for several months. It's not that I was afraid to tackle the project, I just figured it would be so easy that it didn't require a lot of my time or immediate attention. Heh. Ugh. 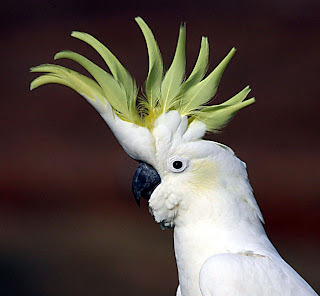 I looked like a cockatoo. Instead of gently molding to my head, the veil stuck straight up in the air, making it look not so much like a veil, but more like a windshield. Needless to say, I was displeased. And here's the thing that none of the tutorials will tell you: trying to fix the plumage effect on the veil while it's on your head is not even remotely easy. I pinched and pulled and tried to maneuver the veil into my ideal headpiece and kept failing. Then I did what I always do when crafting success eludes me: I quit. But, a few days later I tried again, because a Goodlaff will not be beaten by a piece of veiling and some string. Attempts 2, 3, and 4 went much the same way as the first, only with more frustration. I looked for more tutorials online; I flipped through hundreds of veils online and on Etsy, looking for close-up photos and trying to see how others made their veils lay so nicely. I was unsuccessful in finding either a better tutorial or a trade secret. I decided to take inspiration from my feathered friends, and just wing it. I folded down the veiling, basically making darts in the veil material, then safety-pinned it in place to get an idea of my new plan. I was not horrified by the results, so I sewed my folds in place, checked with Mama Goodlaff to make sure it looked okay, and voilà! Veil. It still needs a bit of help: some arranging here and rhinestones there, but all in all, I'm pretty pleased with the base results. Have you ever considered DIY-ing your veil? i like your last attempt! so much better than the first! you're brave though for diy-ing it. i'm just not as talented! "My Dad Knows a Guy..."